May Bank Holiday Week-end 2019. Established in 2011, this initiative promotes and facilitates women’s participation by providing support with skills training and leadership development, inspirational role models and opportunities to network. In 2016, Miko undertook a gruelling, ice and snow-covered climb of Denali in Alaska. Carrying backpacks laden with tents and equipment, encountering terrible weather conditions and temperatures from 20 to 30 below, overcoming altitude sickness and pain, he reached the peak at 6400m. ‘It was a team effort, we all pulled together’. In 2018, Miko undertook the steeper challenge of Mt Manaslu, Nepal. A 7-day trek from base camp at 4700m, initially through forests and mountain villages, then onto a roped-pinned ice and snow path upwards, over crevasses, along a narrow vertiginous track, Mike and his climbing companions reached the tiny made-for-two-people summit at 8153m, and unfurled the Irish flag against a stunning blue sky. Rory Sherlock’s team is our lifeline when we need one. 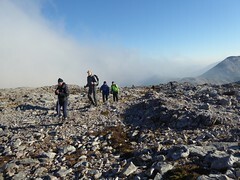 Predominantly covering Connemara and Clare, with 15-20 call-outs a year, the afternoon is the high frequency time, with peak activity on Saturdays, and during the months of April and August. Lower limb fractures are the most common injury, followed by head injuries and medical issues. ECAS, the Emergency Call-out service is now based in the new Garda headquarters in Renmore and serves the west of Ireland from Galway to Donegal. MRI is always looking for volunteers for their bag-packing fundraising days. SAVE THE DATE: An MRI Howl at the Moon moonlight walk will take place on Saturday 12th October 2019. ‘We use nature because it is valuable. We lose it because it is free.’ (Pavan Sukhdev, special adviser to the UN environment programme’s green economy initiative and study leader for TEEB, The Economics of Ecosystems & Biodiversity – http://www.teebweb.org, a global initiative focused on ‘making nature’s values visible’). What is natural capital? The elements of nature that produce value – directly and indirectly – to people, such as the stocks of forests, rivers, soil, minerals and oceans. And under Woodlands of Ireland, https://www.woodlandsofireland.com The Natural Capital Value of Native Woodland in Ireland by Craig Bullock, Jerry Hawe; provisioning (fuel, food, human use), regulating (climate, carbon sequestration, pollination, water filter, soil stability, flood mitigation), cultural (physical/mental/emotional health, aesthetic, spiritual, social, recreational, educational). Paul Barron (Chair), Paul Kellagher (President), Murrough McDonagh (CEO) addressed the meeting. Honorary membership was awarded to Patrick O’Sullivan for his long service and valuable contribution to MI over many years. 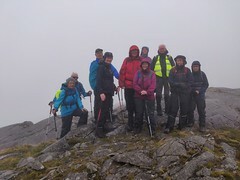 10 aspirant Walking Clubs were elected to Mountaineering Ireland. The 2018 Financial Statement was approved. There are 13,000 MI members, 10,000 are Club members, 3,000 individual members. 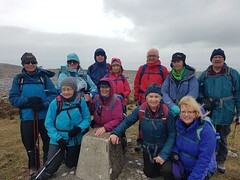 60% of the members are hillwalkers, the remaining 40% are climbers, bouldering members and low walkers. The motion to increase the sub to MI to €35 was proposed by Simon Walsh, MI Board. It has been 14 years since the last increase. Insurance for members and operating costs have increased. The objectives are to clear the deficit and to increase development activities which they hope to achieve in 2020. There is also a strategic plan to increase membership. The motion was passed with 32 for, 2 against. The AGM was followed by the Members’ Forum. Mountaineering Ireland AGM – Saturday 30th March. Registration and refreshments at 1.30 pm. AGM and Members’ Forum at 2.00pm. Venue: Mountaineering Ireland Head Office, Irish Sports HQ, National Sports Campus, Blanchardstown, Dublin 15. Members are invited to put forward motions for discussion at the AGM, through the Club Secretary, before 1st March. 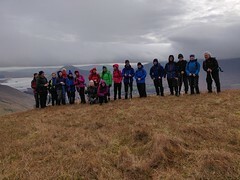 Learning Landscape Symposium 8th-10th March 2019 Burrenbeo Trust https://burrenbeo.com/our-work/learning/training-events/learning-landscape-symposium The symposium will investigate ways to use local resources to make learning a richer, more exciting and rewarding educational experience, as well as an opportunity to network with individuals that work in same sector. All situated in Kinvara and the Burren, the ultimate ‘outdoor classroom’. €80 to attend/ €65 if a member of Burrenbeo Trust. The Studio, Town Hall Theatre Time: 1.10 -1.50 pm. Established in 2011, this initiative promotes and facilitate women’s participation by providing support with skills training and leadership development, inspirational role models and opportunities to network. The Studio, Town Hall Theatre, Time: 1.10 -1.50 pm. Thurs 7th February: Between North and South, East and West. Prehistoric Connections and Transitions in Co. Roscommon. Speaker: Dr Carleton Jones. Thurs 14th February: China and Global Value Chains in the Trump Era. Speaker: Professor Séamus Grimes. Thurs 21st February: Gaelic Learned Family Settlements and Lifeways, 1200-1600 AD. Speaker: Professor Elizabeth Fitzpatrick. Thurs 28th February: What’s Left to Do with Bogs? The History and Future of Irish Peatlands. Speaker: Dr Terry Morley. Devon Park, Lower Salthill, Galway. ‘Devon Park – Where It All Began’ is a publication compiled by a number of residents of the area, including Galway Walking Club member, Mary Fahey, with stories and photographs dating from the 1930s and right up to more recent times. The publication was launched in December 2018. Lower Salthill is situated on the south west side of Galway city. Once part of the O’Hara family’s Lenaboy Estate at Taylor’s Hill, the lands extended over 239 acres from Taylor’s Hill and swept down towards the sea through Devon Park and Lenaboy Park. A wall was built around the estate, sections of which can be seen still along Taylor’s Hill and Lower Salthill near ‘Nile Lodge’ house. The development of houses in the Devon Park housing estate began in the early 1930s. ‘Devon Park – Where It All Began’ is available at Charlie Byrne’s and Kenny Books, Liosbaun Industrial Estate or http://www.kennys.ie. Mountaineering Ireland – OUR MOUNTAIN ENVIRONMENT – Ireland has very little mountain land (less than 6% of our land area is above 300m and just 0.35% is above 600m). These areas are under pressure from a range of sources – changes in agricultural practice, renewable energy development, tourism development, climate change and increased recreational activity. As people who rely upon Ireland’s mountain environment for our recreation activities, we have a responsibility to be a voice for the protection of these special places. The Studio, Town Hall Theatre. Time: 1.10 -1.50 pm. Thurs 31st January: State Supported Segregation? Examining School Choice and Migrant Clustering in Schools. This research examines how school enrolment policy and/or school choice has the potential to become instrumental in the creation of an ethnically segregated school system in Ireland. Speaker: Dr Valerie Ledwith.